Be inspired by top speakers, learn from workshops, network with key industry players and more. 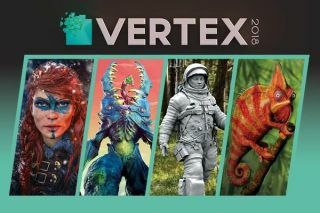 Vertex is the event connecting all areas of the UK visual effects community, for a day of presentations, workshops, recruitment and discussion. Come to watch talks by some of the world's biggest names in VFX, including Scott Ross, Chris Nichols, Brett Ineson, Sébastien Deguy and more. Book tickets for workshops run by some top artists, from Glen Southern to Mike Griggs among others. If you want to get your hands on the very latest tech, then the expo access tickets are for you and are even free but you do need to register to get the tickets, so book now over at the Vertex site. Our speakers will be sharing their wealth of knowledge on a variety of topics set to inspire and educate. In his talk, Christopher Nichols, founding member of the Wikihuman project, will share insights his team have learned while trying to create the most realistic digital human possible. Founder of Digital Domain Scott Ross will use the benefit of his industry experience to discuss what he thinks the pitfalls and opportunities are for the VFX industry. Brett Ineson will talk through translating actors into entirely different species for Justice League and Warcraft – which boasts the largest recorded mocap volume to date. Brett will also reveal behind-the-scenes secrets from Gears of War 4 that powered the game's biggest stunts. For more details about other speakers and workshop leaders, head to www.vertexconf.com. Vertex is the place to head if you are looking to take the next step in your career. Are you an enthusiastic hobbyist looking to take your first role in VFX, a student about to graduate, or an experienced pro? Then head to the recruitment fair, talk to studios about openings they have and even have a portfolio review, to learn how to best promote your skills. You even have the opportunity to ask questions directly to leading professionals in our Ask An Artist segment. There are a variety of tickets available for Vertex, to suit your needs and budget. You can get a free expo pass, student tickets and Access All Areas passes. No matter which ticket suits you best you need to head to the Vertex site and register or buy direct. Be sure to register for the newsletter while you are there to stay up to date with the latest news, discover what's added to the schedule and learn about new speakers we've crammed into the packed day.